Jumping In On the USD/JPY Rally… Again! In my pre-week market analysis, I pointed out that I had a bullish bias on USD/JPY. With price showing signs of retracement, I think it’s about time to think about jumping in long. 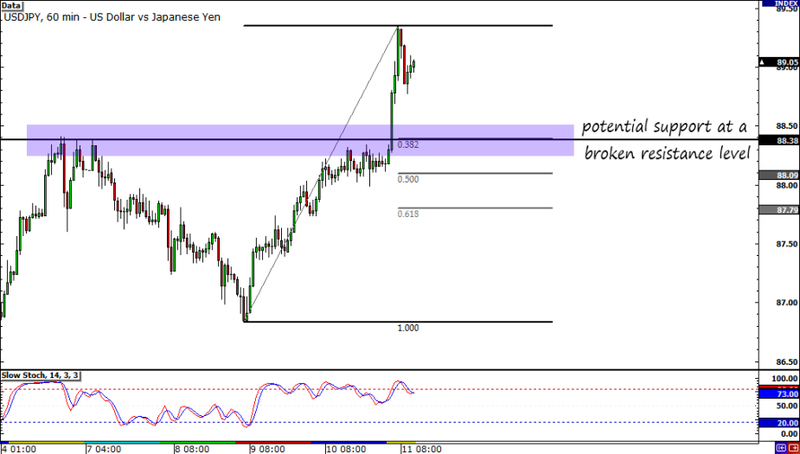 As you can see, USD/JPY seems to have found a temporary top. Price action is falling and is currently on its way to a former broken resistance. I don’t know about you, but this looks like a good area to consider going long as it lines up nicely with the 38.2% Fibonacci retracement area. Also remember that whenever price passes through a major resistance level, that level normally turns into support. If I see some buy signals at around 88.40, I’m going to pull the trigger. After that, I’m going to set a 60-pip stop to allow my trade to breathe. I’m ultimately aiming for new highs but I’m going to close out half my position if price rallies to the 89.00 major psychological level. On the fundamental side of things, we see that risk appetite has made a full comeback. As Pip Diddy reported, a successful Spanish bond auction, positive news from China, and a relatively more optimistic ECB rate statement has boosted the market’s mood. Of course, with market participants more confident about buying higher-yielding assets, the yen has been left at the bottom of the pack. I know that I’ve missed the train before by being conservative with my entry. However, I really do feel that I would regret being aggressive if I pull the trigger too early. And besides, the pair has been on a seemingly non-stop rally. It’s due for a pullback sooner or later, right? Long USD/JPY at 88.40, SL: 87.80, PT: 89.00. 1% risk. Risk disclosure.